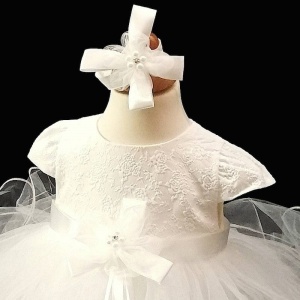 Baby girls ivory bow tulle dress, headband & shoes box set. The perfect baby girls christening dress for her special day. Dress: This beautiful dress in light ivory / off-white has an embossed floral detailing to the short sleeved bodice, with a discreet zip fastening on the back. A detachable satin sash is to the waist with a stunning satin bow, organza flower and diamante / pearls. A full net tulle layered skirt with curly piped edging creates maximum fullness, with a satin underlay. Headband: Light ivory / off-white elasticated satin headband with matching bow, organza flower and diamante / pearls. Shoes: Light ivory / off-white soft satin pearl trim shoes with a matching bow, organza flower and diamante / pearls on the front of each shoe, with a velcro strap fastening. Gift Box: This set is presented in a luxury box to store and protect the items. Please ensure all measurements are checked in the size guide prior to purchase to ensure you select the correct size.